• Kids Reference gives you a call to schedule 1 or 2 preview boxes to arrive at your library at a time of your choosing. • Be sure to keep one copy of the invoice for your records. 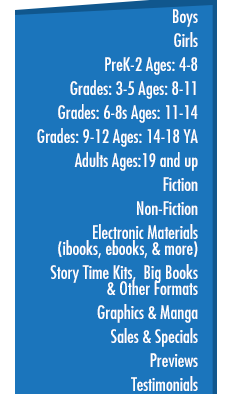 • Choose from Non-Fiction and Fiction packages – select a preferred grade level as well. • You do not have to wait for us to call you to return the books – if you are done before we call you back, just give them to UPS please. • Inside the box is approximately 40 Library Bound titles, 2 copies of a pro forma invoice, an Authorized UPS Return Label, and a Budget Savers Sale List. • WAIT - Hang onto that Budget Savers Sale List! It is a great opportunity to fill in what’s missing in your collection. • Once the box arrives you have an opportunity to pick and choose, hands on, the titles you wish to keep based on what suits your library. • Seal the box back up and put the UPS Return Label on top. • Put the books back in the box that you do not wish to keep. • The next time UPS is in your library, just point out the box to them and they will take it away. • There is never any obligation to buy, and we will never charge you for books you don't want to purchase. • Once your preview box is received back in the warehouse, you will be mailed an invoice for the books you kept. *Feel free to schedule a preview online. Just shoot us an email through our website with your preview selections and a ship date. Current Preview Offers - 2017 Pub Dates!